This Thanksgiving could not have been more different than last year’s (short of not celebrating at all, I suppose). Last year, S and I didn’t live together, but we invited our immediate families to join us in Madison. They flew in from all over the country and helped me prepare dinner. My first-ever hosted holiday was a grand success, and I thoroughly enjoyed crafting the menu and preparing the meal. It was so gratifying to see my loved ones sit down to a filling, healthy, animal-friendly meal on a day that typically centers around a dead bird. This year, our families stayed in their respective homes, so it was just S and I. Sure, we could’ve made a feast for two or invited friends to join, but we didn’t. 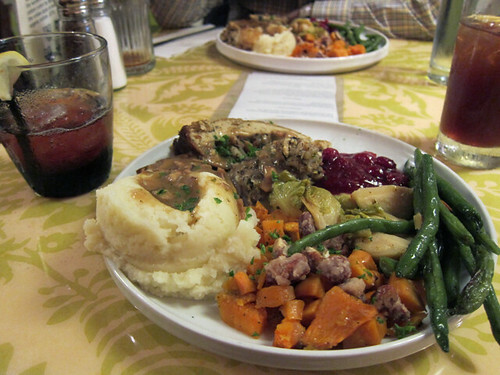 Instead, we had another Thanksgiving first – dining in a restaurant. 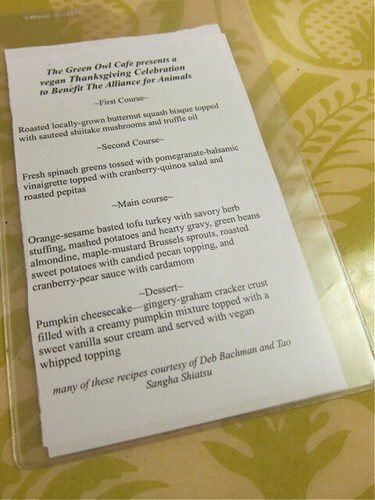 The Green Owl hosted their first-ever vegan Thanksgiving, and I just couldn’t resist going. The meal was only $30, and it included three courses, dessert, and passionfruit iced tea. Plus, a portion of their profits benefited a local animal-rights group. Sold! Dinner began at 1:00. S and I arrived a few minutes early and loitered outside with a quickly growing crowd waiting for the doors to open. We were surprised that many of the other guests were older, ranging from the high end of middle age to bona-fide elderly. How exciting to see older folks, who you’d probably expect to be more traditional, taking part in a vegan feast! The crowd didn’t have to wait too long until the doors opened and a cheerful server wished us a “Happy Thanksgiving!” and welcomed us inside. S and I were seated at our own table, and we eagerly perused the menu (which we’d already seen online) and ordered drinks. S got a brandy-spiked hot apple cider and I ordered a tart, berry-infused vodka cocktail. It took a little longer than expected for our first course to arrive, no doubt because there were only a few actual Green Owl waitresses on hand. Instead, three volunteers helped bus tables and serve food, all for the promise of a free meal after the paying patrons were served. The volunteers were, um, older, and were a little slow on their feet. The seasoned servers were admirably patient, though, even when their helpers got in the way or swung open the kitchen door without a warning. (S and I were seated right in front of said door, so we got to witness a bit of the behind-the-scenes madness.) We didn’t mind waiting, though – it only made us hungrier and readier to devour our meal! Soon, the first course arrived. They’d opted to serve the salad first, not the soup, but we didn’t mind. Truth be told, I was a little worried about this dish. I’m no fan of balsamic vinegar (or vinegar of any variety, really), and salads I’ve gotten here in the past often have a rather heavy-handed application of vinaigrette. I needn’t have worried – everything was just right with this dish. The spinach was lightly dressed, and the pomegranate portion of the vinaigrette masked any unpleasant vinegar aromas. 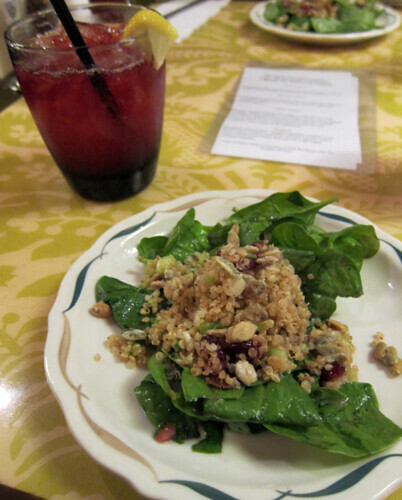 I really loved the cranberry-quinoa salad, too. Even S, who is no fan of quinoa, enjoyed it. The lightly caramelized pepitas were a perfect touch on top. Next up was the soup course. There was a bit of a delay between salad and soup, but nobody seemed to mind. 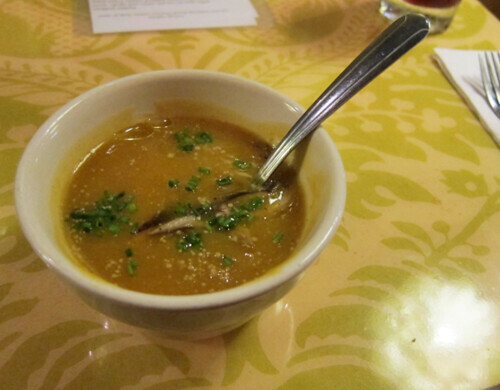 This was one of the best butternut squash bisques I’ve had in a while, probably because it was a bit non-traditional. I’m not a huge bisque enthusiast (see: texture issues), so I really appreciated the diced chives and lovely slices of shiitake in this one. And the truffle oil added a wonderful nuanced flavor. I only wished the portion had been a bit larger! It’s probably for the best that it wasn’t, though, or else I wouldn’t have had room for the main course. Frisbee-shaped plate aside, ain’t this just a beautiful sight to see? It was the quintessential traditional Thanksgiving dinner. The mashed potatoes, tofu turkey, and cranberry-pear (!) sauce were my favorite elements – the potatoes were wonderfully fluffy (and totally lump free!) the tofu turkey was surprisingly un-tofu-like, and the sauce was a perfect mix of whole berries, pear pieces, and more liquidy portions for smearing on potatoes. ;) The the sweet potatoes with candied pecans were also a stand-out element, and the green beans almondine were a refreshingly simple side. I didn’t really notice much about the stuffing, and the Brussels sprouts were a bit of a disappointment – I couldn’t discern maple or mustard, and they were a little mushy for my taste (S remarked that my sprouts are better – win!). All in all, it was a wonderfully satisfying meal, and I made sure to save about 1/3 of my plate for leftovers… and so that I’d be able to eat my dessert. 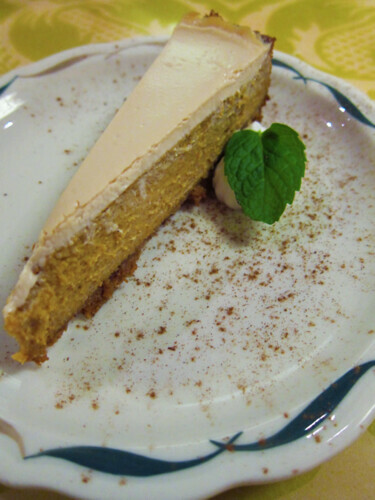 The Green Owl is well-known for its creative, decadent, vegan (and often raw) desserts, and this pumpkin cheesecake did not disappoint. It was spicy, sweet, and the perfect end to our meal. The portion size was a bit small, but I’m not sure I could’ve eaten much more! How did you celebrate Thanksgiving (if at all)? Have you ever gone out to eat on a holiday? Sounds like a great time and delicious meal. We missed you both here and it seamed a bit “empty” with out you. The food was great and Jason and Jessie added a mix of “new” to the day…. See you soon. Well, at least Christmas will be less “empty”! I travel to Madison for work several times a year (I’m from Milwaukee originally), and I love the Green Owl! Looks like they made a Thanksgiving menu anyone would love to eat. They really did! So good. What a great idea to go out. Make a lot of sense especially if there are just 2 of you. Looks like a fabulous meal too :) I’ve been on holiday for Christmas before so we ate in a hotel- it was fun but I’ll admit I think I’d have preferred to have celebrated at home..
Now if only they’d do that in our home with all of us together!